Ballymena United manager David Jeffrey and Coleraine boss Oran Kearney are both licking their lips in anticipation of Saturday’s Irish Cup quarter-final showdown at the Ballymena Showgrounds. And the tie itself could not be even more evenly matched as both sides are on a high. United in recent weeks have lifted the League Cup and qualified for the top six in the Irish League for the first time in the club’s history - while the Bannsiders are unbeaten in their last nine under boss Kearney. 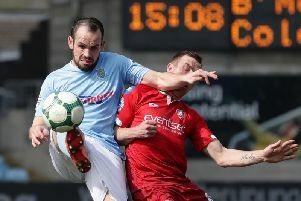 So the stage is set for an Irish Cup classic in front of a sold-out Showgrounds and Sky Blues boss Jeffrey just wants to get started. “It is a massive, massive game. “We are looking forward to it. It will be a tough, tough match but we know that. “They are a good side but we are up for it. “But for now we are going to celebrate securing a top six finish in the league and then we will get down to thinking about Coleraine. “We are looking forward to it and there will be a great crowd and atmosphere,” said Jeffrey. And Jeffrey was delighted his troops secured a top six league finish after beating Ballinamallard United 2-1 last weekend. “I am pleased. It is the first time Ballymena have made the top six,” he added. And Coleraine boss Kearney echoed the remarks of his managerial rival and says the defeat to the Sky Blues in the semi-final of the League Cup was a bitter pill to swallow. “We are really looking forward to it, we have performed better in the League Cup than the Irish Cup in recent seasons and that’s something we want to put right. “And with Ballymena beating us in the League Cup semi final that’s something we wold like to put right too. “We are ready for it and will be determined to go there and secure our place in the semi final. “It’s a massive, massive game and one I’m sure everyone is looking forward to. “Obviously we are without a left back now following Adam Mullan’s sending off, but it gives the opportunity to someone else now. “Ballymena are going very well under Davy (Jeffrey), but I don’t think anyone is shocked by that. “He has made a massive difference, and rightly so he’s a fantastic manager. “But when we go to Saturday it’s 11 v 11 out on the pitch and myself and Davy will stand to the side and watch the two sets of troops go at it. “This is what football is all about. These big games with big crowds and we are really looking forward to it. “And we want that semi-final spot, but we know it will not be easy and we will have to battle for everything,” he added.